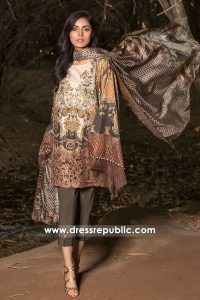 Fans of Pakistani designer Sobia Nazir immediately recognized and responded to her beautiful new collection just arrived at Dress Republic store. For the Winter 2017 collection, designer Sobia Nazir did not stray too far from the traditional brand DNA and avoided big sized floral looks which have been as the cornerstones for every other designer in Pakistan. Her designs have intricate floral design and leaf work, the dresses and trousers included navy, almond, chocolate brown and pale green and champagne. Click through to see every look from Sobia Nazir Winter 2017 Collection. With premium quality design and stitching services we are be to deliver a product that is matched to our expectations. Order your piece today with Dress Republic Fashion Store.